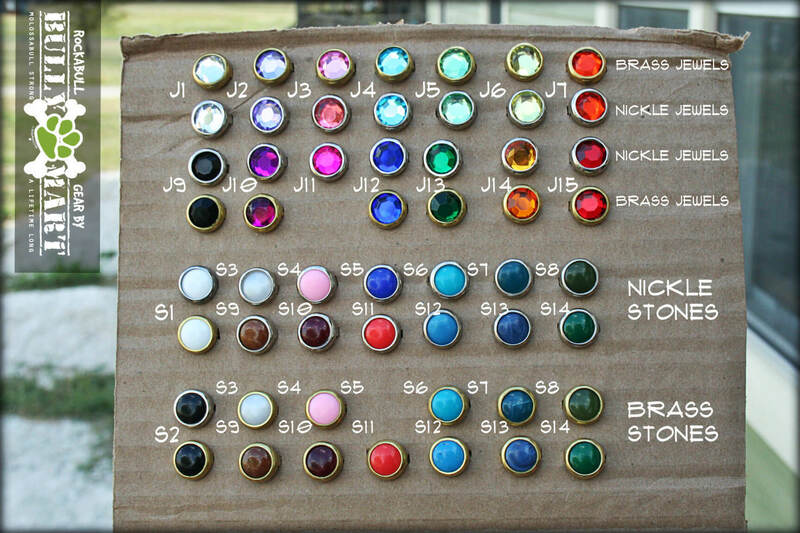 Here are some of the available options such as leather color, stamped font type, jewel & stone colors, etc. Our standard leather options are american crafted hides from american raised steer and come from the best of the best in quality. We utilize both Bridle & Latigo leathers in a range of weights with the most common being 9 to 11 ounce leathers. From time to time we will carry lighter weights for use primarly on smaller dog collars however most often times we find ourselves thinning the heavier stuff for the itty bitty necks when the lighter weight hides are not in stock. Our everyday Canyon Tan, Burgundy, Black, & Chocolate leathers are premium Bridle leather found in use by some of the top equestrian saddle & tack connoisseures in the trade. 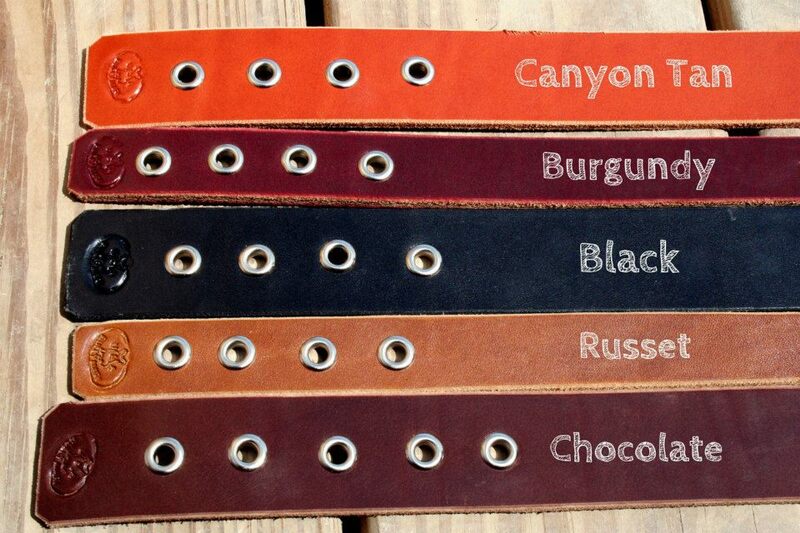 Our russet is some of the best quality horse tack quality latigo leather you can find on the market today. Please note before you select our white leather color that it is a DESIGNER latigo leather. It is not as stiff or rugged as our Standard Horse Tack Bridle & Latigo Leathers area. 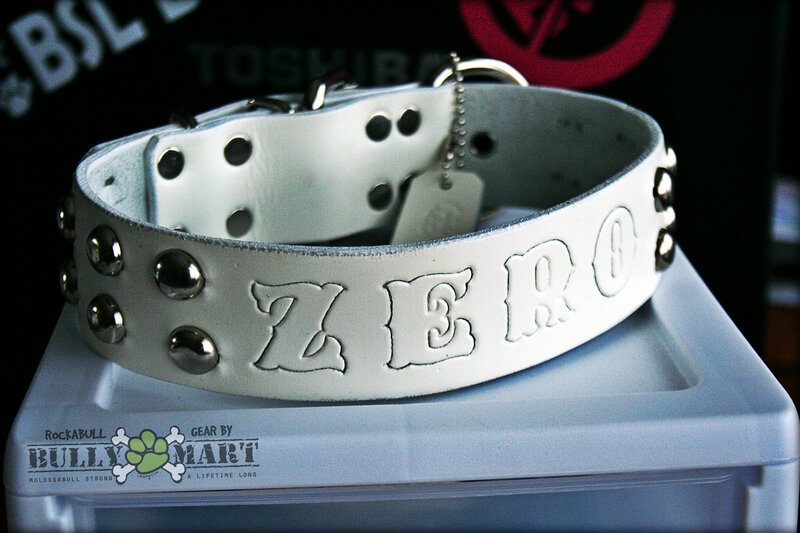 This is best used as a LUX collar or as a top layer for bigger dogs. 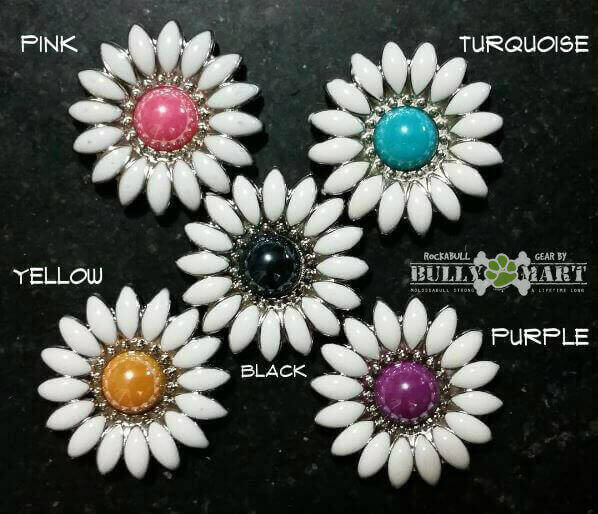 This weight is great for smaller or more sensitive necks as either single or lux collar. It is super pliable and soft, however stong enough to hold our lifetime structure guarantee, just a little more lightweight than our returning clients are used to. 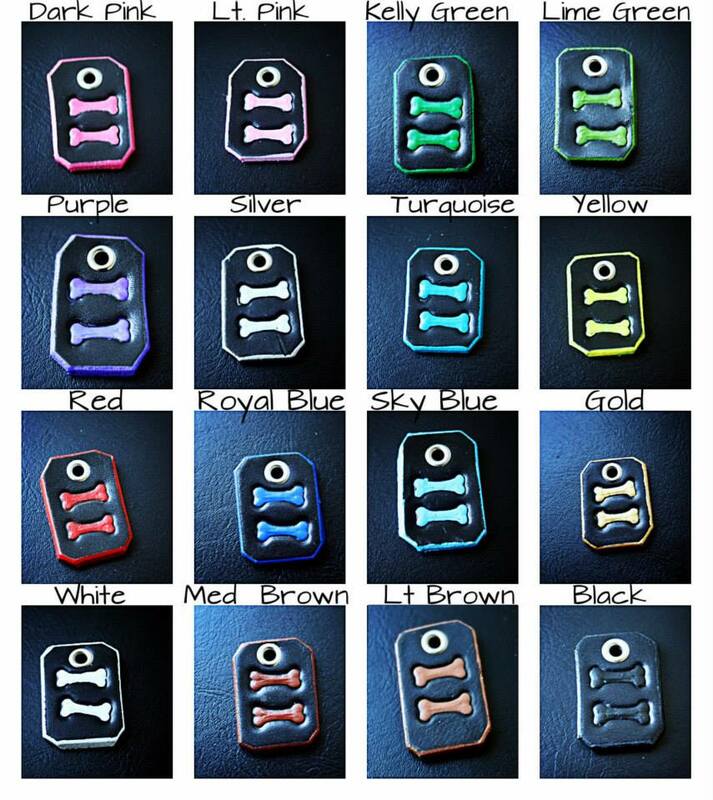 If you dog is SUPER hard on their collars this color option may not be the best choice as it gets dirty super easy. *Our White leather does best with decorations vs. being stamped with letters (as shown here). From time to time we will come across our premium dyed colors in full out hides that meet our quality testing to be utilized in our products. Our premium dyed color options all start our as premium quality Vegtable Tanned leather. The blank slate canvas of the leather world. We take this leather, deglaze any excess residue, dirt, etc to ensure a nice clean smooth surface to prepare it to accect the dying & conditiong process we do in house for our premium colors. These premium colors come both a a premium price and add a bit of extra time to your order as the process is somewhat time consuming to ensure proper dye coverage, conditioning, and sealing. It is VERY important when you pick your colors you make sure you have the correct one selected. We cannot be held responsbile if an item you recieve does not have the color you actually wanted. You MUST be sure to double and even triple check your option selections prior to confirming purchase. Please note the Cobalt Blue jewel is now more a Royal Blue jewel and the Turquoise Green jewel is now more of an Emerald Green jewel. The Cranberry [S10] stone looks kinda weird in this pic & The Hot Pink jewel [J11] is not available in brass at this time. Our stamped font options are not as abundant as our custom carved but they are beautiful none the less. Please pay special attention to the text you choose for your collar width as not all stamped fonts can fit on all collar widths or neck sizes. Should your collar's text exceed the decorative surface for your font type selected we WILL alternate the font to the smaller stamped font type to fit. ***For example if you selected LG BLOCK but have too many letters for the stampable space we will use the SMALL BLOCK letters instead.